A Day Late and A Dollar Short: Apple iPad Mini Case - $5.98 SHIPPED - Amazon! Apple iPad Mini Case - $5.98 SHIPPED - Amazon! Right now, you can get this Apple iPad mini case for only $5.98 with **FREE** shipping! As always, Amazon fluctuates their prices frequently. So, if interested, you might want to buy soon rather than later. Injection molded interior for rigid support and protection. Built-in magnetic strip provides sleep / wake feature. 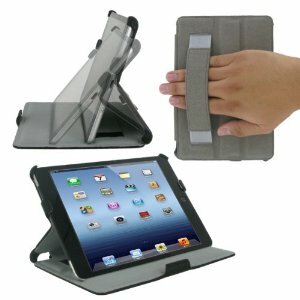 3 adjustable angles for typing, viewing or displaying. Smooth soft lining interior to protect from scratching. Handstrap to safely carry iPad Mini with one hand. Click on any of the images in this post to view and/or purchase.